Call tracking software is an essential tool for measuring the performance and response of any or all of your on and offline advertising. No more guessing where your phone calls come from, or worrying about asking the caller "where did you find us? ", phone call tracking software does this all for you! 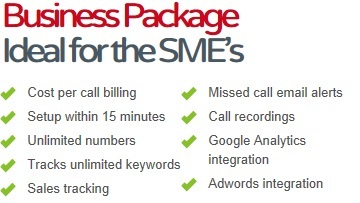 Benefits of call tracking software. How call tracking software works. Our call tracking software is simple to set up and you can start getting stats within a matter of hours. Simply replace all phone numbers on your website with a snippet of code (you may need to get your website designer to do this). Often your designer can simply use "find and replace" site wide to do this so it shouldn't take very long to implement at all. Once the code has been added, a unique phone number appears to every website visitor on every page they visit, and the call tracking software records which page they were on when they picked up the phone to call your business, and from what source they used to land on your website, PPC, organic, and all the way down to exactly what keyword was typed in! A simple to use reporting system will give you all the info you need to then optimise your advertising for better ROI. Call 01524 37900 now to speak with one of our friendly team. We can explain the benefits of our call tracking system in more detail, discuss pricing and how to set up the software. Get started today.